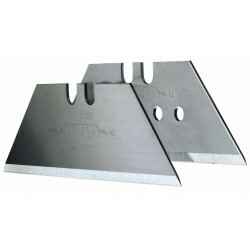 Boxed Dimensions & Weight:W: 7.0cm H: 61.5cm D: 7.0cm ⋅ 3.2kgFeatures:Forged SteelBarcode:501369.. Ideal for removing excess paint/stickers from windowsSupplied with 1 heavy duty blade..
Stanley Scraper Blades (pack of 10)..
Boxed Dimensions & Weight:W: 34.5cm H: 6.5cm D: 6.5cm ⋅ 775gFeatures:Hard-wearingResists weather..
Boxed Dimensions & Weight:W: 3.0cm H: 9.0cm D: 16.5cm ⋅ 105gFeatures:The Henry Squire CP50CS Com.. Recommended for household use, this product is ideal for removing paint from walls and woodwork o..